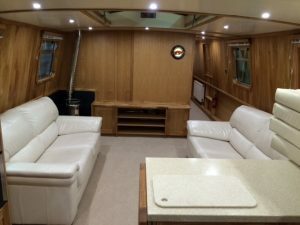 The Vegas River Cruiser is designed with all the characteristics of a city apartment but with the capability of cruising the waterways, UK and European with simplicity. 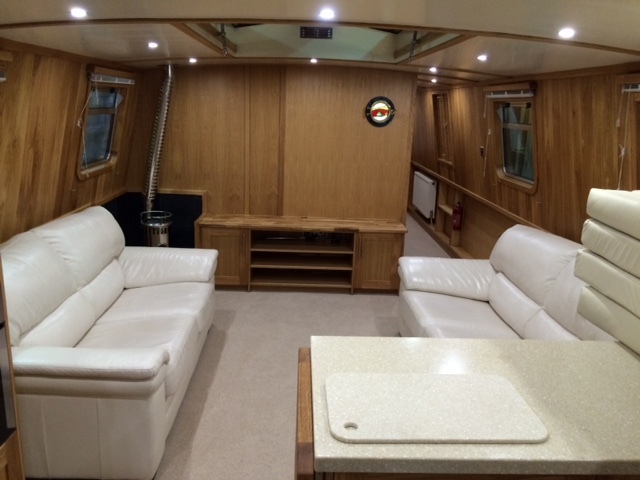 The Vegas River Cruiser is 60ft x 12ft and built with a chine making it highly responsive to the helm, therefore it dramatically improves the manoeuvrability, making the River Cruiser a joy to steer. A chine also facilitates mooring in shallow waters. The Vegas River Cruiser is also fitted with hydraulic steering to enable defined steering of the boat. 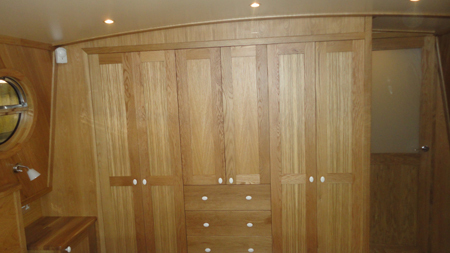 They are built with a rounded square stern, lockers and a curved wraparound seating area to maximise the outdoor space. The Vegas River Cruisers are externally shot blasted (except base plate) to remove the mill scale, formed when hot rolled. Under the waterline is painted with a two pack epoxy blacking. 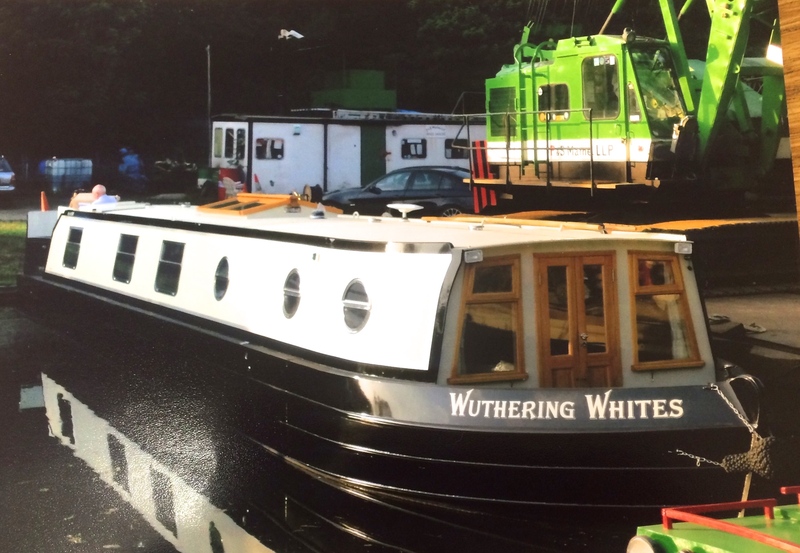 Above the waterline is painted in a two pack paint system to provide prolonged impact & abrasion protection. Fitted out using only the finest quality materials, including solid oak, by our team of experienced craftsmen, the Vegas River Cruiser offers excellent value for money with a very competitive price tag. 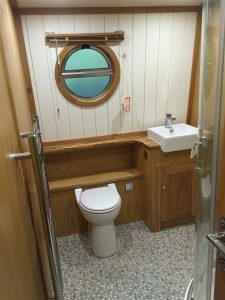 The layout of the River Cruiser from bow to stern is: Bedroom, Bathroom, 2nd bedroom (optional), Saloon followed by the Galley. The River Cruisers are British built by ourselves from base plate to sign writing and come complete with a Recreational Craft Directive, Category D, full owner’s manual with operating instructions, issued by an independent surveyor and a 12 month warranty. Vetus 65hp 4 cylinder keel cooled engine, 3 or 4 bladed propeller to suit with ZF25 gearbox, MP22 standard control panel, 35mm water lubricated stern tube, 35mm shaft, 2” exhaust with lagging. One auto bilge pump. 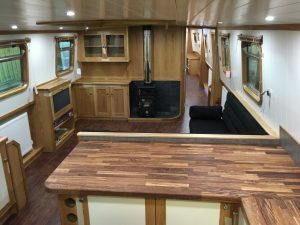 Webasto 5kw diesel central heating system running 4 radiators and a heated towel rail through a 75 litre twin calorifier situated in the engine room. 240V is supplied by a 3000w inverter/charger, shoreline power, socket and lead. 240V is supplied through a distribution panel with two ring main circuits and one immersion heater high load circuit. Boat protection is provided by a Victron galvanic isolator. 12v power is supplied by 5 x 120 amp sealed for life batteries (upgrades available) charged from the engine alternator and inverter/charger to the main isolation switch and main fuse board onto DC switch/fuse panel to all circuits. Tunnel light and horn switched from rear deck control area. A choice of TV antenna or satellite cable fitted. The Vegas River Cruisers are painted in a two-pack system from the leading specialists in paint, International Paints. Primer, undercoat and top coat in Perfection is applied in two colours with coach line. Intertuf 362, a two-pack blacking is applied up to the top rubbing strake (except base plate). All decks, roof and gunwhales are sanded to provide a non-slip surface. Upon completion of the steelwork the exterior of the hull (except base plate) is shot-blasted to Sa2.5. A two pack epoxy primer Interprime 820 is applied to all areas above the top rubbing strake. Two pack Intertuf 362 is applied to all areas below except for the base plate.